FNA – Iranian Foreign Minister Mohammad Javad Zarif held separate meetings here in Tehran on Monday with new Senegalese ambassador to Tehran as well as the United Nations Development Program (UNDP) envoy. During the meeting, Senegal’s new ambassador to Tehran submitted a copy of his credentials to the Iranian top diplomat. 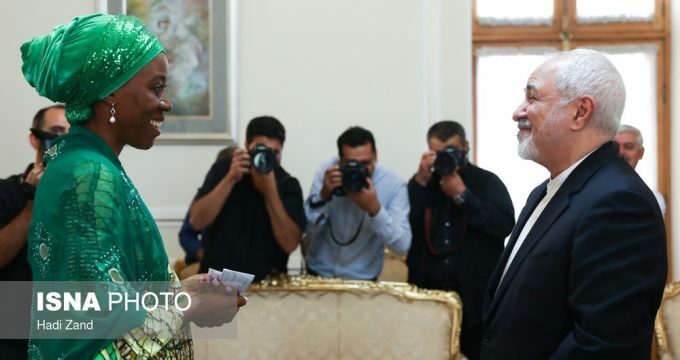 Zarif also held a meeting with UN Development Program’s envoy to Iran Ugochi Daniels in Tehran on Monday. Meantime, the Iranian foreign minister also held separate meetings with the outgoing Japanese and Kazakh ambassadors to Tehran earlier today. In a relevant development in 2017, Iranian Vice President for Women and Family Affairs Massoumeh Ebtekar and United Nations Development Program Administrator Helen Clark in a meeting in Iceland discussed mutual cooperation. During the meeting on the sidelines of Women Political Leaders (WPL) Global Forum in Iceland, Ebtekar and Clark discussed the capacities for development of cooperation in the region. The two sides underlined holding training courses for women empowerment, in particular in the areas that are affected by the climate change. The Iranian vice president stressed importance of paying attention to status of refugees, particularly women and children, in war-torn regions. The UNDP head, for her part, underlined using mechanisms to protect peace and promote people’s understanding.